We’re going to have a meal-time quiz. Please have a look at these statements. If you answered C, you are correct. Welcome to my life with a 45-pound Food Network addict. I’d like to thank the recent surge in kids’ cooking competitions for fueling my eye-of-the-tiger daughter with the drive to perfect her craft. And to critique her mother every step of the way. It started last year, very innocently, with her newfound love of baking. We kept it easy — cakes, muffins, cookies and cupcakes from boxed mixes and icing from cans. She enjoyed helping me mix and decorate. Life was simple then. I bought her a little baking cookbook for her birthday last summer, and that’s when her focus became a little more intense. She would dog-ear the pages of the recipes she aspired to make with me and discuss at length how I needed to adjust my grocery list to accommodate her plans. And then the Kids’ Baking Championship came along on the Food Network, and her mind was blown. Frankly, so was mine. 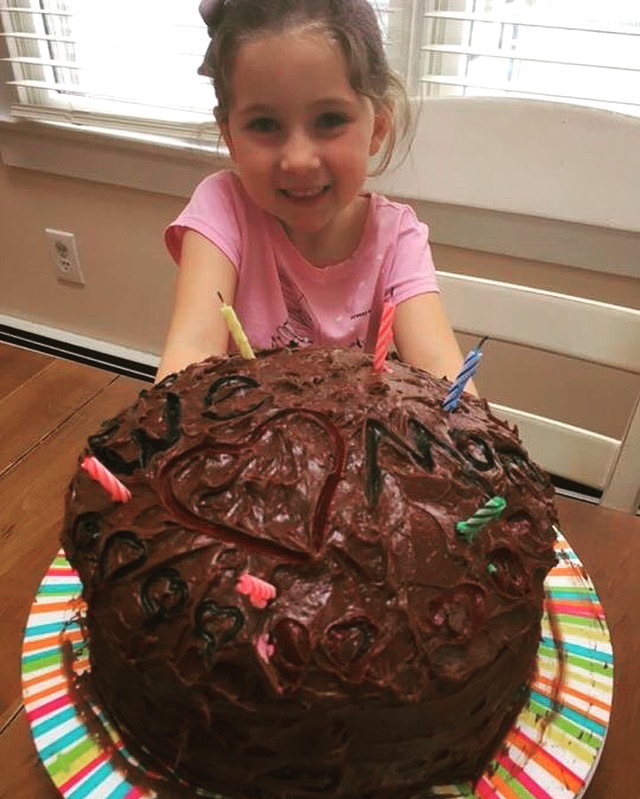 How the hell do these kids know how to come up with these creative baking solutions on the spot and impress Valerie Bertinelli and Duff Goldman (both of whom, incidentally, now rank at near-Santa celebrity status in my daughter’s eyes)? In her weekly trips to the school library, she blew off Fancy Nancy in favor of borrowing baking cookbooks. We practiced reading at night by using words like non-stick, vanilla and Bundt. 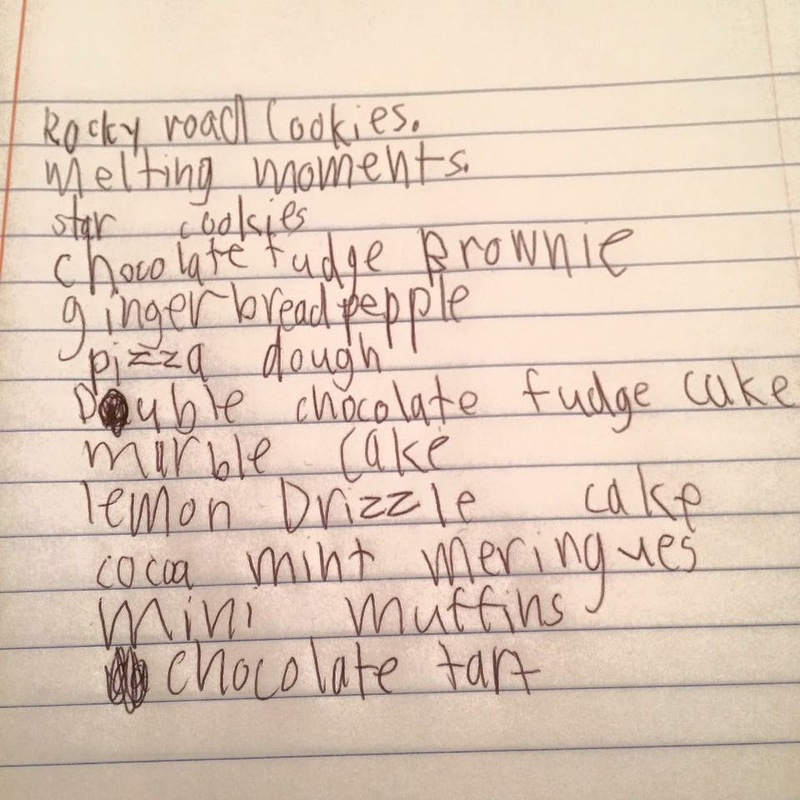 The baking lists became longer. While her favorite show went on seasonal hiatus, she discovered Chopped Junior. I was relieved to get a change of scenery on the TV and was also pleasantly surprised that she was branching out beyond baked goods. For a while. 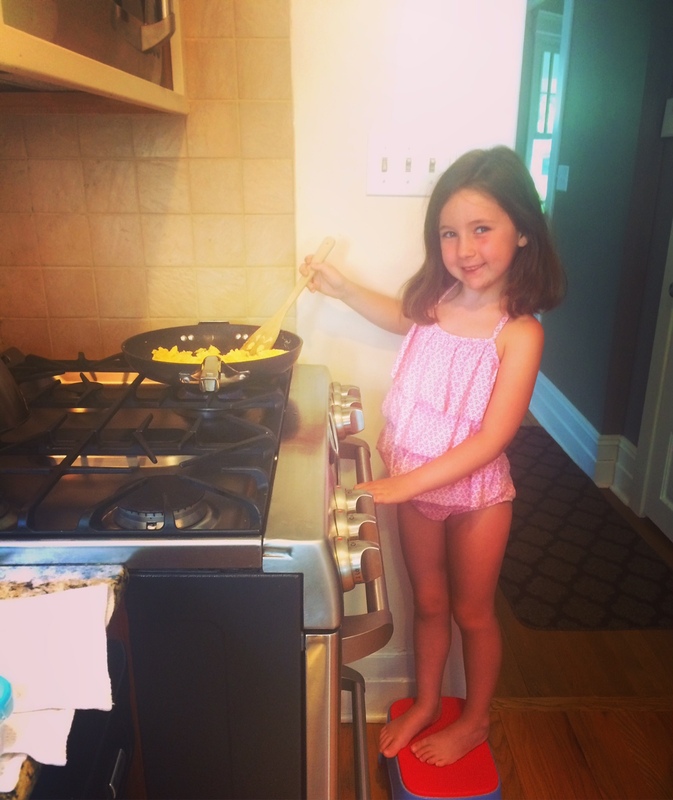 She cooked breakfast for us (because who doesn’t prep eggs in a tankini?). And, with adult assistance, some dinner as well. And (bonus points!) my birthday cake. This was really turning out nicely — a mother/daughter bonding experience in the kitchen, where I could pass along life lessons or share the divine recipes of my grandmother with her. OR, it could go another way. 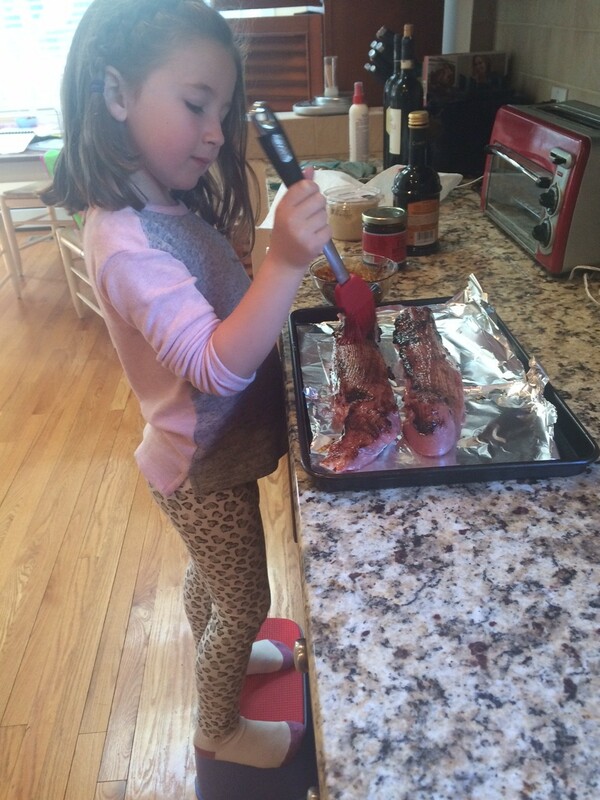 Instead of memorable bonding, my daughter could instead begin judging my culinary techniques and output, asking if perhaps the pork was a touch overdone or if I planned to season the broccoli with anything else, or if maybe our station was too messy — all while pretending to be on live television as she narrates every move on our countertop. I think she is actually starting to believe she is being filmed by a hidden production crew that magically fits in my house. She even allows her older brother to be a guest judge sometimes. Once our actual food prep is complete and she re-hashes how I can do a better job in the future, we generally move on to pretend role play in the form of re-enacting the cooking and baking shows. In these games, she chooses a contestant from a beloved episode (invariably, a girl who wore pink or purple) and then recites their food preparation notes back to the pretend judge (me). She marches out to the elimination round with her hands behind her back, just like the Food Network standards, and awaits her pretend fate. She feigns shock every time when she prods me to declare her the winner. Is it Oscar season yet? The other component that has become very important in recent weeks is practicing her introduction for any potential appearance on these shows. You know, the way you get acquainted with a contestant in the opening minutes through a brief and peppy bio. She first likes to work on her entrance into the competitive TV studio kitchen (often a hybrid of the I-can’t-believe-I’m-here and I’m-confident-as-hell approaches, both tried and true), as well as the facts she’d choose to present about herself to her adoring audience. (Which gymnastics move should she do in the footage? Does she have to mention her older brother by name?). Her toddler brother, ever the apprentice in this process, has been instructed to perfect his entrance and not run so quickly past the judges. To date, he hasn’t been great about absorbing and incorporating constructive feedback. She’s working on him. He is the sous chef to her cooking championship dreams, following her around and asking with sincere curiosity who got chopped at the end of the episode. “Becky? Becky got chopped?” he demands. And so it goes. The thrill of victory and the agony of defeat, all in the test kitchen. And, hey, thanks Food Network, for your latest installment into overachieving children with flames: Kids’ Barbecue Championship. You just made my summer grilling far more complicated. In the meantime, I have to go check my seasonings and straighten up my station before the head chef gets home.